The product was not re-inspected prior to entering the U.S.
Maxfield Seafood of City of Industry, Calif., is recalling approximately 55,300 pounds of Sheat fish. The products were not re-inspected prior to entering the U.S.
14-oz. clear bag packages containing Maxfield Seafood SHEAT FISH CA TREN KET with EXPIRY DATE of 200324, 200403, 201007, 201008, 201113, 201115, 201222 and 201227. 14-oz. 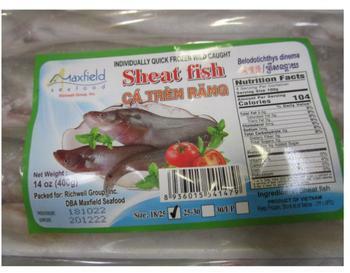 clear bag packages containing Maxfield Seafood SHEAT FISH CA TREN RANG with EXPIRY DATE (some labels dont display an expiration date) of 200324, 200403, 201007, 201008, 201113, 201115, 201222 and 201227. The recalled products were shipped to retail locations nationwide. Consumers with questions about the recall may contact Bradley Martin at (626) 964-8230.